Item is a black and white copy of the full score for part 3A of Nasca Lines in graphic notation. A rectangle in the centre of the score features the same image as part 3, an aerial representation of an area of the Nazca Desert in Peru with the condor geoglyph in the middle. 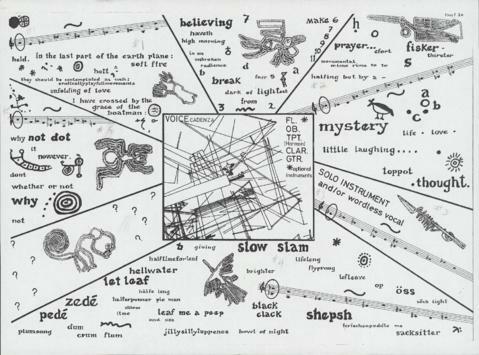 Radiating outward from the central rectangle are seven sections, each featuring a graphical representation of one of the Nazca Lines geoglyphs and phrases from Alan Davie's texts and/or a tone row. The geoglyphs included are the hands, pelican, spider, monkey, condor, and two unidentified glyphs. Item also includes a copy of the five tone rows used in this part of the composition, extracted from the full score. The score was annotated by the flautist for the premiere performance.